To truly feel energy within oneself is something wonderful, because this experience revives our spirits and strengthens the soul enormously. Especially powerful is the energy of Hanuman, for he is an incarnation of Shiva. Shiva destroys the old, the illusion and the spurious. In Hanuman the Shiva energy is combined with an enormous devotion and love that we sense within us when we really connect with the Hanuman energy. 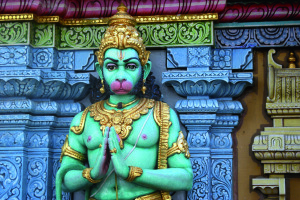 Hanuman is one of the best known energies of India, depicted in the shape of a hybrid of man and ape. He is thought to be the son of the wind element, the most powerful incarnation of Shiva, who is the cosmic energy, and is connected to mental powers. Connecting with his high, powerful vibrations boosts our own energies enormously and helps us reinforce our mental power and transform it into the manifestation. Hanuman’s power, that you tap into during the Hanuman Chalisa, destroys negativity and brings forth the new. We are very much looking forward to the Hanuman Chalisa that will take part at the end of July at our Source of Power – Spiritbalance Sadhana Ashram in Sasbachwalden (Germany). You are cordially invited to take part! What is the meaning of the Hanuman Chalisa? This entry was posted in Hanuman Chalisa and tagged ashram in germany, bharati, Black forest, Chalisa, chalisa germany, hanuman, hanuman chalisa, hanuman chalisa germany, hanuman chalisa with bharati, Sasbachwalden, spiritual south germany on June 6, 2016 by jennyhumke. Energetical greetings from Bad Dürrheim! Wednesday, December 30th the Hanuman Chalisa will already kick off! This entry was posted in Hanuman Chalisa and tagged 108 times, bharati, chanting, hanuman chalisa, Mantra Chant, spiritbalance, spiritual experience on December 29, 2015 by jennyhumke. a few more weeks and it will be the turning of the year, something to celebrate together with a wonderfully powerful Hanuman Chalisa. Will you be there? The invigorating and vividly celebrated Hanuman Chalisa takes place on New Year’s Eve and you are cordially invited to participate! Actually we had planned for the Chalisa to take place in Yoga Center Rottweil. But since we have a lot of nocturnal yoga retreat guests among us, and we can’t very well cut ourselves in two, we have decided spontaneously that the Hanuman Chalisa is to take place once more here in Bad Durrheim. Which means that it will be wonderful to be able to experience the energy along with the retreat guests, but regrettably this also means that the number of places is limited. This entry was posted in Hanuman Chalisa and tagged bharati, hanuman, hanuman chalisa, mantra, meditation, spiritbalance, spiritual experience on December 15, 2015 by jennyhumke. we greet you wholeheartedly from India. Raguvendra Das is also here with us and offers his power and energy to the intense energetic process happening here. Raguvendra Das is a pure Hanuman Bhakta and one of the rare authentic and pure yogis. He would like to pass on his energy and wisdom in Germany as well. There is a change that I will be inviting him next year to visit us – preferably to one of our Hanuman Chalisas. The next powerful Hanuman Chalisa will be held exactly on New Year’s Eve and you are wholeheartedly invited to be part of it. The Chalisa will take place again in the YOGA Center in Rottweil and we wish that many people will come to raise positive energy together, make spiritual experiences and receive soul healing and especially to transform negativity. The world needs that especially now. This entry was posted in General, Hanuman Chalisa and tagged bhakti, bharati, Chalisa, hanuman, hanuman chalisa, raguvendra das, Silvester, spiritbalance, Tulsidas, Yogi on October 27, 2015 by jennyhumke.